LONDON -- Troy Smith, who has yet to take a first-team practice snap with the 49ers, will be the team's starting quarterback Sunday against the Denver Broncos, coach Mike Singletary announced Wednesday morning. Alex Smith is expected to miss 2 to 3 weeks with a left shoulder separation, Singletary said. David Carr has been demoted after struggling against the Carolina Panthers after taking over for Alex Smith. Carr completed 5 of 13 passes for 67 yards and a critical interception in the 49ers' 23-20 loss to the Panthers. "The bottom line is I think for where we are, Troy Smith gives us a good opportunity to win the game," Singletary said. 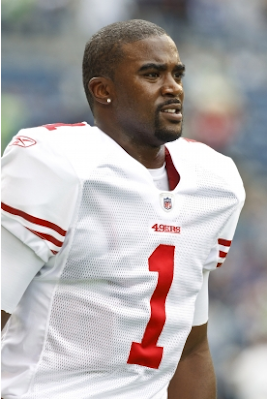 Troy Smith was signed to a one-year contract leading up to the 49ers' first game of the regular season after the Baltimore Ravens released him at the final cutdown date. "Probably the No. 1 thing I like about him is leadership," Singletary said. "The ability to get everybody on the same page." There are no other changes to the 49ers' starting lineup, Singletary said. Alex Smith and center Eric Heitmann (neck) are the only players who have been ruled out for Sunday's game, but reserve cornerback Tarell Brown (back) is unlikely to play, Singletary said. Guard Chilo Rachal (stinger), running back Anthony Dixon (hamstring strain), tackle Joe Staley (stinger) and safety Taylor Mays (stinger) are all day-to-day. There was no plan to activate practice-squad quarterback Nate Davis to the 53-man roster, Singletary said. The 49ers did make one move: waiving safety Chris Maragos and activating cornerback Tramaine Brock.